The territory that would one day become Jasper County, Missouri was purchased by the U.S. Government from the Osage Indians for $1,200 in cash and $1,500 in merchandise in 1808. The Native Americans were then moved to an area designated as the Osage Nation. Though a number of them tried to return to their native lands in 1837, they were soon driven back to their territory. Jasper County was formed in 1841, with a 12’x16’ split log house on a bluff above Spring River, designated as the first county seat. The newly formed government required that each white male was help to build the public roads through the county at least two days per year or pay a 50 cent tax. 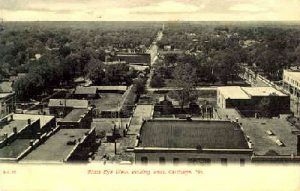 A year later, the county adopted the site of Carthage as the permanent county seat and laid out the new town site surrounding a public square. On the north side of the square, a simple one room frame courthouse was built at a cost of $398.50, completed in June, 1842. Other frame buildings soon followed, housing Carthage’s first businesses. By 1851, the prospering little town had outgrown its small wooden courthouse and the building was replaced by a two-story brick structure. 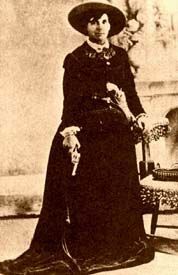 In 1856, John Shirley, the father of the notorious would-be outlaw “Bandit Queen,” Belle Starr, moved his family from his nearby farm to Carthage, where they built an inn, a tavern, livery stable and blacksmith shop on the north side of Carthage’s court house square. Their businesses took up almost an entire city block and John Shirley became a respected member of the burgeoning county seat of Carthage. Though Belle was raised with the life of a spoiled, rich girl, that life would change when the Kansas-Missouri Border War broke out. In 1854, the Kansas–Nebraska Act opened up the new state of Kansas, allowing its residents to make up their own minds on the question of slavery. Having strong southern sympathies, the state of Missouri quickly became embroiled in a bitter fight with the newly settled anti-slavery groups that populated the new state. The border towns in both states quickly became the sites of fierce guerilla warfare in the Kansas-Missouri Border War that prefaced the Civil War by more than six years. Carthage was no exception in the bitter fighting between the two factions. 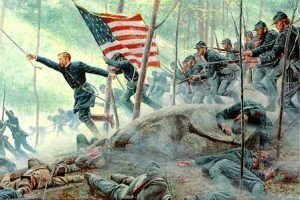 In fact, on July 5, 1861, the first large scale engagement of the Civil War took place in Carthage when 6,000 poorly equipped Missouri State Guardsmen held off 1,100 Union Soldiers. Both sides declared victory and would meet up again a month later at Wilson’s Creek. Jasper County watched both armies pass through time and again, forcing residents to take sides, and making neighbors into bitter enemies. Irregular bands of “Jayhawkers” and “Red Legs” laid waste to Missouri communities in support of the Union. When Belle Starr’s brother, Bud, joined Quantrill’s Raiders, John Shirley was a proud father. But in June 1864 Bud was killed in Sarcoxie, Missouri. The raids had taken their toll on Shirley’s businesses and after Bud’s death, the family gave up and moved to Texas. It was in Texas, that Belle would begin her notorious outlaw career. The battles preceding the Civil War and the skirmishes that followed, destroyed the small settlement of Carthage. Though its courthouse continued to serve until 1863, it was destroyed by fire in the ravages of war. Soon, all of Carthage’s 500 residents had joined the war efforts or moved away from the war-torn town. By 1868, Carthage had grown to a population 1,200 and boasted a school, four churches, three doctors, two hotels, five boarding houses, six dry good stories, five grocery stores, and scores of other businesses. Continuing to grow, Carthage was called home to some 6,000 people by 1873, adding several industries, including a woolen mill, two foundries, three wagon and carriage makers, a furniture factory, and a wealth of other businesses. In the late 1880s Carthage discovered rich deposits of limestone, lead and zinc beneath the town and in the surrounding area. 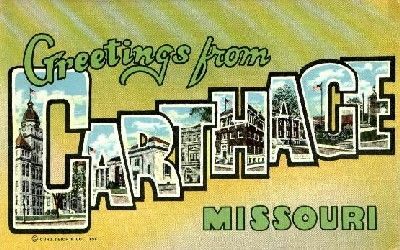 Through these gifts from the earth, Carthage soon became one of the most prosperous towns in the state and was called Queen City of the Southwest by the 1890s. The corner stone of the present Court House was laid in August, 1894 and was completed in 1895, at a cost of $100,000. After the Civil War, came the Wild West days and Carthage’s new courthouse became the site of many public hangings. According to old-timers, these events were public spectacles where vendors set up booths, selling food and trinkets. The gallows, built right upon the grounds of courthouse, became the “stage” for many viewers who brought their lunches, enjoying a picnic during the show. This magnificent structure remains in use today. By the end of the nineteenth century, Carthage had more millionaires per capita than any other city in the United States. The primary source of the wealth were the rich deposits of lead and zinc and soon, the mine owners began to build fine homes in Carthage. Huge deposits of gray marble at the north edge of Carthage provided another source of prosperity. In fact, the Missouri State Capitol, U.S. Capitol and White House are faced with marble that came from the Carthage area. Yet more mills and factories began to pop up in the thriving rebuilt city. 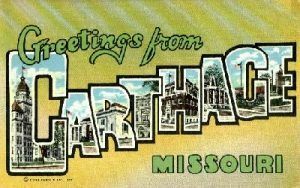 By the year 1900, Carthage had approximately 12,000 inhabitants and over one hundred business and industrial concerns. When Route 66 was built through the town, Carthage was soon proclaimed by its Chamber of Commerce as “The Open Gate to the Ozarks.” In no time, all manner of services began to spring up to serve the many travelers of the Mother Road. As you travel through Carthage you will see the Powers Museum located on the first alignment of Route 66 on Carthage’s west side along with Municipal Park that was developed during the 1930s thanks to several New Deal programs. This site was once home to the Taylor Tourist Park, later renamed the Park Motor Court and Café. As Route 66 winds its way through Carthage, you can see many historical buildings on the Town Square including its 1894 historic courthouse. 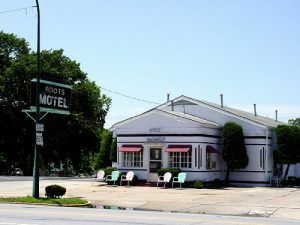 About a block from the Town Square, at the intersection of Missouri Highway 71 and Route 66, is a “must see” along your trek through Carthage — the historic Boots Court Motel. Built as a tourist court in 1939 by Arthur Boots, this popular stop along the old Mother Road, once advertised a radio and every room and reportedly, Clark Gable once stayed in Room 6. The Boots Motel is a classic example of Streamline Architecture that was so popular during this era. Across from the Boots Motel, once stood the Boots Drive-in that offered fountain service and “Breakfast at any hour!” The drive-in thrived throughout the 1940s but declined after the Interstate bypassed Carthage and finally closed in 1971. However, the building was preserved and today is utilized as bank. One block north of the Boots Motel stands the remains of another old tourist court – the Dazy Apartments and Sleeping Rooms. While its obvious that the Dazy has seen much better days, it still appears to remain in use today. Carthage is also home to one of the few surviving drive-in theaters left in America. Thanks to the efforts of Mark and Dixie Goodman, this old drive-in has not gone the way of most of these old icons. When the Goodmans bought the historic drive-in, it was in a state of much disrepair, however, they have brought this old theatre back to life. Just before you reach Webb City, you will pass through the small town of Carterville, another lead mining town of the region. Once prosperous, the town declined following World War I and never recovered like its nearby neighbors of Webb City and Joplin.